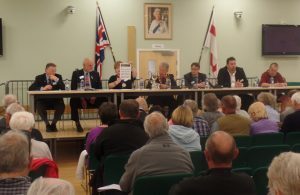 Infrastructure requirements and the current town centre transport improvement works were among the items raised at Hailsham Town Council’s Annual Town Meeting held at the Civic Community Hall yesterday evening [20 April], at which over 80 residents attended. The meeting, which was chaired by the Town Mayor and Chairman, Councillor Nigel Coltman was attended by representatives from the Hailsham Neighbourhood Planning Team, Wealden District Council’s planning department, East Sussex Highways and the local Neighbourhood Policing Team (among other organisations) which provided information and answered questions from residents before the formal part of the meeting. Town councillors and Council officers responded to a number of issues raised by Hailsham residents including the ongoing roadworks in the town centre, car parking and enforcement and the need for additional public toilet facilities. At the meeting, the Town Mayor presented the 2017 Hailsham Hero Community Award to Malcolm Richards, founder and trustee of Hailsham Foodbank, who was selected by a committee made up of town councillors and residents from nominations submitted earlier this year. Hailsham Town Council will next be holding its Annual Council Meeting which takes place at the Town Council offices in Market Street on Wednesday 24th May from 7.30pm. Members of the public are cordially invited to attend and witness the election of the Town Mayor and Chairman for the coming year (2017-2018).